This set of Concrete Technology online test focuses on “American Concrete Method of Mix Design”. Explanation: The slump value is depended on the degree of workability and placing condition. Explanation: The value for the maximum size of aggregate depends on the economical availability and dimensions of the structure determine. Explanation: For the given slump and maximum size of coarse aggregate determine the amount of mixing water. 4. Determine the _______ either from strength considerations or from durability considerations. Explanation: Determine the minimum water-cement ratio either from strength considerations or from durability considerations. Explanation: Determine the amount of cement per unit volume of concrete from the maximum size of aggregate and the amount of mixing water. 6. This cement content should ________ the cement content required based on durability criteria. Explanation: This cement content should not be less than the cement content required based on durability criteria. Explanation: According to ACI mix design, the lower the w/c ratio, higher the strength of concrete. 8. The aim of the designer should always be to get concrete mixtures of optimum strength at __ cement content and ________ workability. Explanation: The aim of the designer should always be to get concrete mixtures of optimum strength at minimum cement content and acceptable workability. Explanation: Maximum size of aggregates should not be larger than 1/5 the minimum dimension of structural members. Explanation: Maximum size of aggregates should not be larger than 1/3 the thickness of a slab. 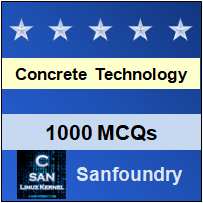 To practice all areas of Concrete Technology for online tests, here is complete set of 1000+ Multiple Choice Questions and Answers.